Ah, robotics. If it were only sexier. That’s pretty much the biggest hurdle of this exciting industry. You might think otherwise, however, and claim that a fully functional AI is the big challenge facing primitive robot kind at its current state. Fine, that’s valid too. But really, a good dose of aesthetics should go into robot manufacturing. At their best, most somewhat autonomous robots look like clunky appliances circa the Jetsons. Ugh! Seen above is a very scary quadruped in the making. Ominous, to say the least. Anyway, long story short a lab at the U of Pennsylvania are testing modular robotics. It’s a new branch of general robotics and aims to allow average robots some procreative powers. By ‘procreative’ is meant the ability to create offspring—out of foam. That’s right. 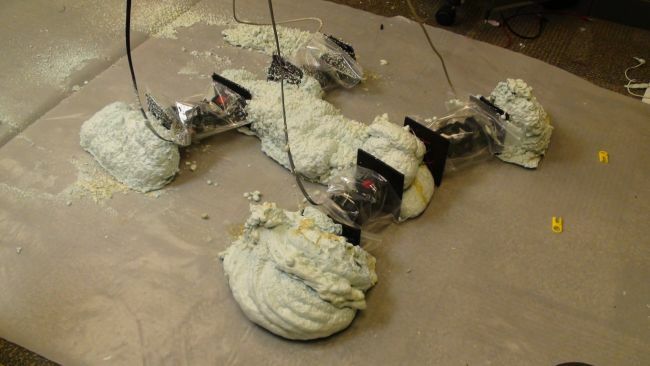 At its present state FoamBot is a pretty crude invention that’s basically a box of insulation foam on a wheeled chassis. What makes it special is its programming. FoamBot is capale of ‘building’ other robots ut of foam. Sicne they’re amd eof foam, the scientist testing them think they’re more modular. At the moment, however, FoamBot and its kids all look ugly, just globs of foam incapable of complex tasks. Oh well, the program is still in its infancy.